I was waiting for this moment that allows me to meet many representatives of the countless Shrines scattered in every region of the world. How much we need the Shrines in the daily journey that the Church does! They are the place where our people more willingly gather to express their faith in simplicity, and according to the various traditions that have been learned since childhood. In many ways, our Shrines are irreplaceable because they keep popular piety alive, enriching it with a catechetical formation that sustains and reinforces the faith and nourishes at the same time the testimony of charity. This is very important: keep popular piety alive and do not forget that jewel that is the number 48 of Evangelii nuntiandi, where St. Paul VI changed the name from "popular religiosity" to "popular piety". It's a gem. That is the inspiration of popular piety which, as once said by an Italian bishop, "is the Church's immune system". It saves us from many things. I thank Archbishop Rino Fisichella for the words with which he introduced our meeting and that offer me the opportunity for some considerations. I think, first of all, of the importance of hospitality to be reserved for pilgrims. We know that more and more often our Sanctuaries are a destination not of organized groups, but of individual pilgrims or autonomous groups who set out to reach these holy places. It is sad when it happens that, on their arrival, there is no one to give them a word of welcome and welcome them as pilgrims who have made a journey, often long, to reach the Sanctuary. And uglier still is when they find the door closed! It can not happen that more attention is paid to material and financial needs, forgetting that the most important reality is the pilgrims. They are the ones that count. The bread comes later, but first them. Toward each of them we must be careful to make sure that he feels "at home", like a family long awaited who has finally arrived. We must also consider that many people visit the Sanctuary because it belongs to the local tradition; sometimes because his works of art are an attraction; or because it is located in a natural environment of great beauty and charm. These people, when they are welcomed, become more open to opening their hearts and allowing it to be shaped by grace. 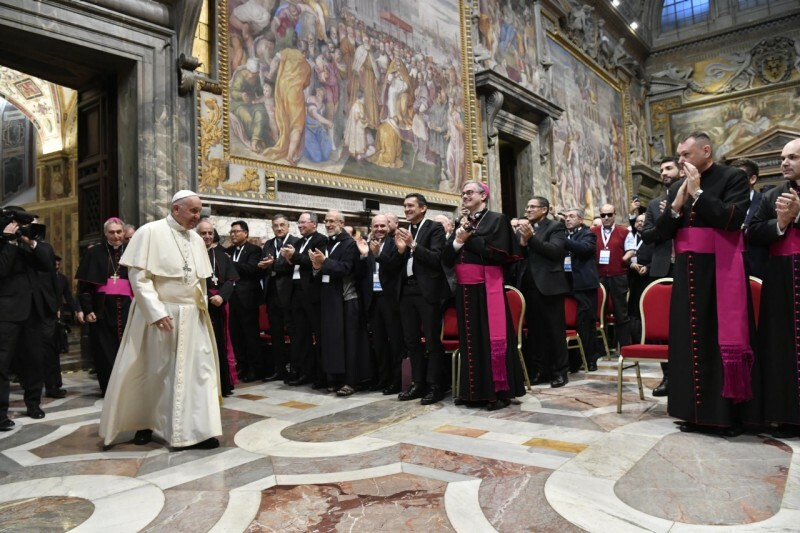 A climate of friendship is a fertile seed that our Shrines can throw into the soil of the pilgrims, allowing them to rediscover that trust in the Church that sometimes may have been disappointed by an indifference received. The Sanctuary is above all - second thing - place of prayer. Most of our shrines are dedicated to Marian piety. Here the Virgin Mary opens the arms of her maternal love to listen to everyone's prayer and to fulfill it. The feelings that every pilgrim feels in the most profound of the heart are those that he finds also in the Mother of God. Here she smiles giving consolation. Here you shed tears with those who cry. Here he presents to each one the Son of God held tight in his arms as the most precious good that every mother possesses. Here Mary becomes the street companion of every person who raises her eyes asking for a grace, certain to be granted. The Virgin responds to all with the intensity of her gaze, which the artists have been able to paint often guided in turn from above in contemplation. About the prayer in the Shrines I would like to underline two requirements. First of all, to encourage the prayer of the Church that makes salvation present and efficacious with the celebration of the sacraments. This allows anyone present in the Shrine to feel part of a larger community that from every part of the earth professes the only faith, witnesses the same love and lives the same hope. Many Shrines have arisen precisely because of the prayer request that the Virgin Mary has addressed to the seer, so that the Church never forgets the words of the Lord Jesus to pray without interruption (cf. Lk 18: 1) and to remain always vigilant in waiting for the his return (cf. Mk 14:28). Moreover, the Sanctuaries are called to nourish the prayer of the individual pilgrim in the silence of his heart. With the words of the heart, with silence, with his formulas learned by heart as a child, with his gestures of piety ... everyone must be able to be helped to express his personal prayer. Many come to the Shrine because they need to receive a grace, and then return to thank them for having experienced it, often for having received strength and peace in the trial. This prayer makes the Shrines fertile places, because the piety of the people is always nourished and grows in the knowledge of the love of God. No one in our Shrines should feel like a stranger, especially when he comes to us with the weight of his own sin. And here I would like to make the last consideration: the Sanctuary is a privileged place to experience mercy that knows no boundaries. This is one of the reasons that led me to want the "Door of mercy" also in the Shrines during the Extraordinary Jubilee. In fact, when mercy is lived, it becomes a form of real evangelization, because it transforms those who receive mercy into witnesses of mercy. In the first place, the sacrament of Reconciliation, which is so often celebrated in the Shrines, needs well-trained, holy, merciful priests who are able to make the true encounter with the forgiving Lord taste. I hope that especially in the Shrines the figure of the "Missionary of Mercy" will never be lacking - if in some sanctuary there is not, ask the dicastery - as a faithful witness of the love of the Father who extends his arms and goes happy encounter for having rediscovered those who had left (cf. Lk 15: 11-32). Finally, the works of mercy ask to be lived in a particular way in our Shrines, because in them generosity and charity are realized in a natural and spontaneous way as acts of obedience and love to the Lord Jesus and to the Virgin Mary. Dear brothers and sisters, I ask the Mother of God to support you and accompany you in this great pastoral responsibility entrusted to you. I bless you and I pray for you. And you too, please, do not forget to pray and have me pray in your shrines. And, before finishing, I would like to talk about an experience, an experience of a brother and even mine. The Shrine is a place, so to speak, of the meeting not only with the pilgrim, with God, but also with the meeting of us pastors with our people. The liturgy of February 2nd tells us that the Lord goes to the Shrine to meet his people, to go out to meet his people, understand the people of God, without prejudices; the people endowed with that "nose" of faith, of that infallibilitas in believing of which n. 12 of the Lumen gentium. This meeting is fundamental. If the pastor who is in the Shrine can not meet the people of God, it is better for the bishop to give him another mission, because he is not suitable for that; and he will suffer so much and make the people suffer. I remember - and now I come to the anecdote - a professor of literature, a man who had so much genius. All of life was a Jesuit; All of his life has been a professor of high-level literature. Then he retired and asked the Provincial: "I am retired, but I would like to do something pastoral in a poor neighborhood, have contact with the people, with the people ...". And the Provincial entrusted him with a neighborhood of very devout people, who went to the Sanctuaries, which had this spirit, but very poor, more or less a shantytown. And he had to come once a week to the community of the theology faculty, where I was rector. He spent the whole day with us, in fraternity, then returned. Thus he maintained life in community. And since he had genius, one day he told me: "You must tell the professor of ecclesiology that he lacks two theses" - "How come?" - "Yes, two theses that he must teach" - "And what are they?" - " The first: the holy faithful people of God is ontologically Olympic, that is to say that he does what he wants; and second: it is metaphysically tedious, that is, stove ". He had understood in the meetings how and why he tired the people of God. If you are in contact with the people of God, you will get tired. A pastoral worker who does not get tired leaves me very perplexed! And with regard to the fact that he is "Olympic", that is, he does what he wants, I remember when I was a novice master: I went every year - as a provincial with novices - to the Sanctuary of Salta, to the North of Argentina, to the feasts of Señor del Milagro. Coming out of the Mass - I confessed, during the Mass - there were so many people, and a lady of the people approached another priest with some saints: "Father, blesses them? ", And that priest, a very smart theologian, he says: "But madam, have you been to the Mass?" - "Yes" - "And do you know that at Mass there is the sacrifice of Calvary, is Jesus Christ present?" "Yes, padrecito, yes" - "And do you know that all these things are more than blessed?" - "Yes, padrecito" - "And you know that in the final blessing you bless everything?" - "Yes, padrecito". And at that moment, another priest came out, and the lady: "Father, do you bless me?". And he touched them and blessed them. He got what he wanted: to touch them. The religious sense of touch. People touch the images, "touch God". Thanks for what you do! And now I give you the blessing.